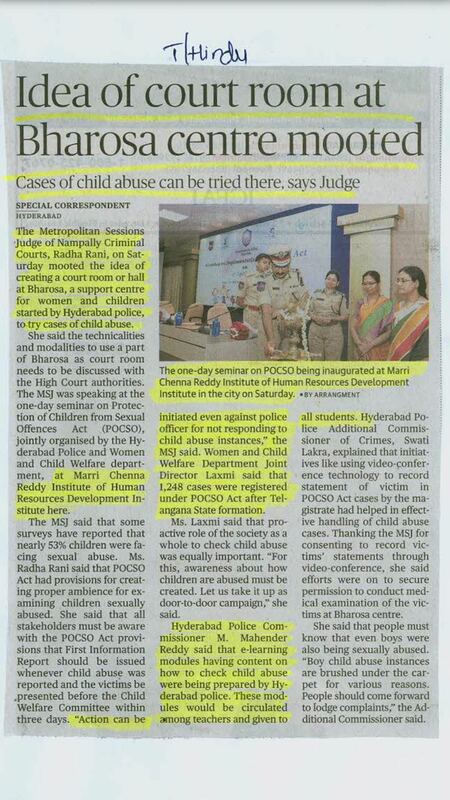 Tharuni under GAA Project collaborated with Bharosa Support Center,of Hyderabad Police, organized one day Consultation on implementation of PoCSO Act of 2012, to the Police Officers of 62 Police Stations in Hyderabad,Public Prosecutors and Child Welfare Officers, on 1st April 2017, at Marri Chenna Reddy Human Resouce Devt. Institute Jubilee hills. Metropolitan Sessions Judge Smt. 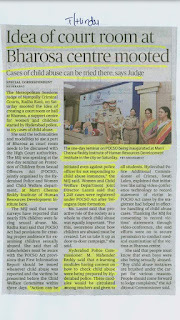 Radhika Rani was the Chief guest, and Commissioner of Police Sri Mahender Reddy was the Guest of Honour.Addl. Commissioner of Police Smt. Swati Lakra presided over the Meeting.Women Welfare & Child devt. Officers, Dr. Mamatha Raghuveer, Founder Member Tharuni,Pooja Kandula, Prerana NGO from Mumbai, and others enlightened the participants on the history and implementation of the Act. Tharuni under the Girls Advocacy Alliance Project,of Terres des Hommes, Netherlands, prepared a Hand Book on the Child Related legal enactments and the role of Police Officers, and the Wall Papers to be kept in Police Stations, were distributed to the participants.